Brian Harnetty is a musician and artist from Ohio, and his work involves overlooked elements of sound. Many of his pieces transform found material -- including field recordings, transcriptions, and historic recordings -- into personal sound worlds. For the past several years, this has led to a focus on projects with specific archives, including the Berea College Appalachian Sound Archives in Kentucky. 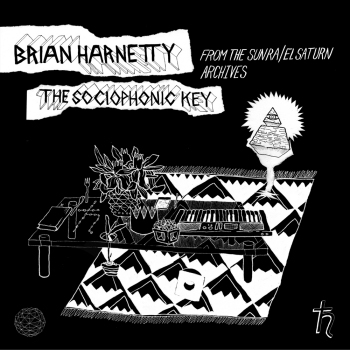 More recently, Brian Harnetty was commissioned by the Electronic Sound Studio in Chicago to work with the Sun Ra / El Saturn archive. When Brian Harnetty was commissioned to work with the Sun Ra / El Saturn archives in Chicago, his goal was to develop a series of conversations with Sun Ra through the many recordings in the collection. On one level, the resulting pieces combine these diverse materials to create a sonic collage. On another level, Harnetty uses these elements to reveal multi-layered stories, drawing out the many connections and complexities of the Sun Ra archives. June 2012, Keith Hanlon's Scioto Records label released a first 7" single from this project: "The Sociophonic Key". With "The Sociophonic Key," Harnetty has created a stand-alone work drawn from "The Star Faced One," a 2010 sound installation at the Experimental Sound Studio in Chicago. Despite the variety of samples used many subtle relationships are heard--both literal and fantastic--from Sun Ra rehearsing a group of children fading into an answering machine, to the intensity of a gospel preacher alongside the Arkestra's invitation to join them in outer space.